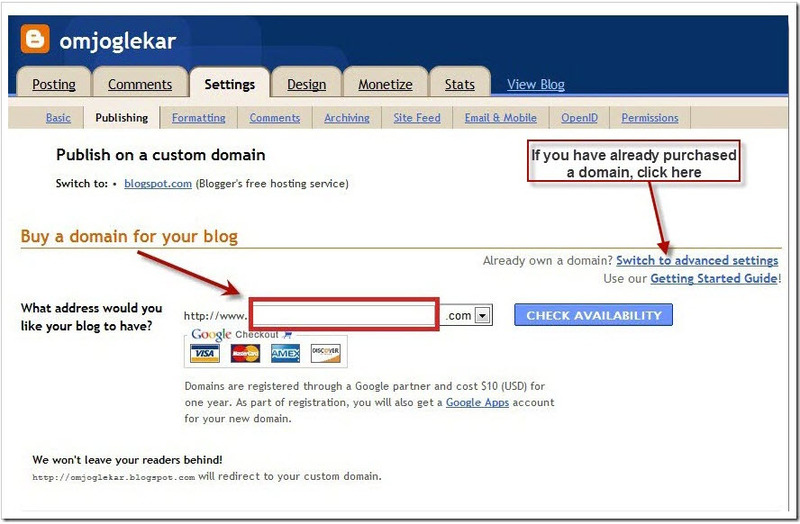 When you create your free blog on Blogger.com, it gives you a default domain, which looks something like this myblog.blogspot.com. 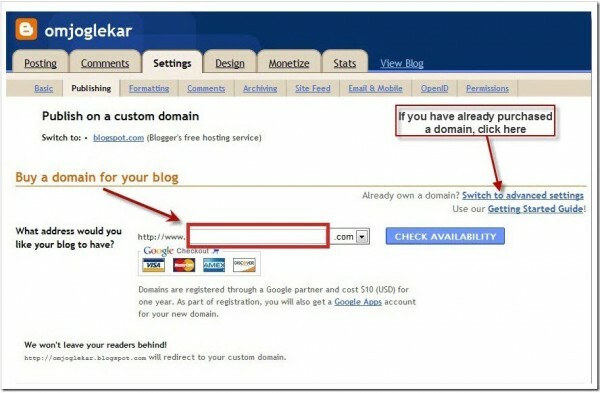 It also provides you with the option of creating your own domain name, such as myblog.com or myblog.org. 1. Log in to your Blogger account and go to the Publishing tab which can be found under the Settings tab. 2. Enter your desired domain name in the box and chose the extension (.com, .org, .net ) and check for its availability by clicking the Check Availability button. 3. If the domain name you provided is available, you can proceed further to the set up page. 4. If you have already purchased a domain, click on the Switch to Advanced settings, and enter your own domain name as shown in the screenshot below. Blogger.com takes care of DNS setup and domain management as well, unlike other registrars such as Godaddy, I Love This Domain, where you’ll have to configure DNS settings to point your blog to Blogger (Google.com) IP addresses.